​Rovell's taken his talents from the Worldwide Leader to the new gambling website Action Network, but his Twitter following remains, and they are forever savage. 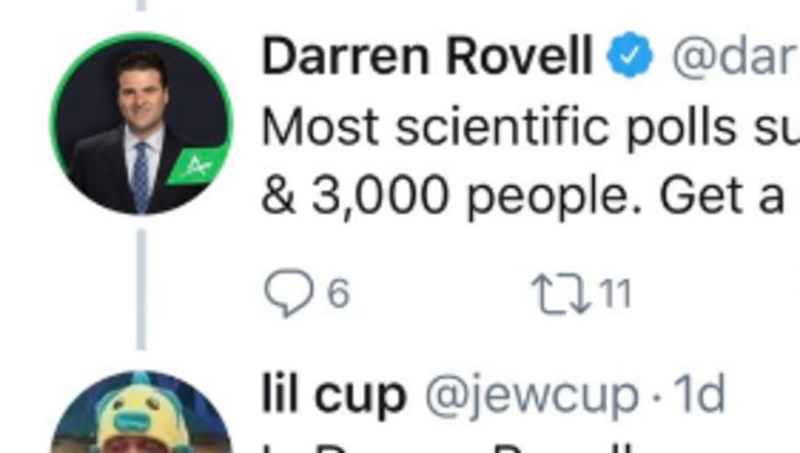 After suggesting a scary future for the NFL due to the tendency of fans to prefer to watch games from their couch rather than at stadiums around the country, one Twitter user pointed out a clear flaw in a poll Rovell used to prove his point -- only 34,000 people voted. Now, sure, this seems innocent enough. Money talks, and Rovell is simply providing us an example of the league's shift towards gaining revenue in TV deals, rather than at the stadiums where these games take place. But this isn't how social media works. Random man behind a keyboard is not kind. Rovell's not wrong here, 34,000 votes is traditionally a good sample size. Most scientific polls survey between 1,000 & 3,000 people. Get a clue. Wait...is Darren actually going to win a Twitter argument for once? There's a first time for everything. If this poll gets 1,000 votes it must be true. Oh no. Surely there's nothing wrong with being a homosexual, and that's not the point to be made here. It's simply that a poll can sway any audience based on the content provided.